As per reports coming in, Ratan Tata has invested an undisclosed amount in Paytm, India’s largest mobile ecommerce company. This makes Ratan Tata’s 5th venture into ecommerce space. Ratan Tata, Chairman emeritus of $100 billion Tata Sons, investment in Paytm reflects the confidence and emphasis towards ecommerce companies in India. 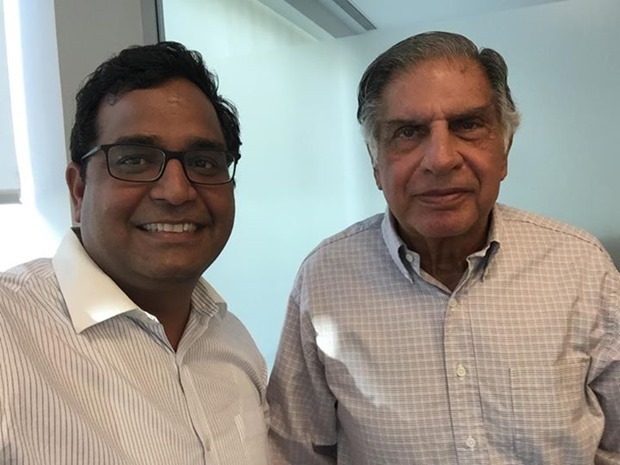 On March 3rd, Vijay had shared a selfie with Ratan Tata with this caption: “My selfie moment with the most humble person I know.” It seems that the meeting was held regarding this investment purpose only. Right now, Paytm is growing at a breakneck speed, clocking in Gross Merchandize Value (GMV) of Rs 16 crore daily and more than 3,00,000 transactions daily. About 25 million users have an active wallet with Paytm, having an average deposit of Rs 150. They have plans to have 100 million active wallets and $4 billion of GMV by 2015 end. Buoyed by $575 million investment by Alibaba early this year, Paytm is right on course to take on Flipkart, Amazon and Snapdeal in coming days. They were earlier awarded as India’s best digital wallet by IAMAI. Ratan started his ecommerce journey with a disclosed investment in Snapdeal in August last year. We had reported that how this marks a new phase in the Indian ecommerce industry as a veteran investing in a young startup, engaged in a young industry improves the credibility of the whole eco-system. After Snapdeal, Ratan Tata invested in Bluestone, which is an online jewellery portal started by IIT graduates. Considering that Tata owns their own jewellery chain Tanishq, this investment raised quite a few eyebrows. Later, in the month of November last year, Ratan Tata made another investment in the ecommerce space: Urban Ladder, which had already raised venture capital from SAIF Partners and Kalaari Capital same month. Last month, Ratan Tata created ripples across the startup community when he made another personal investment in another ecommerce startup: GirnarSoft, which runs popular portals Cardekho, Pricedekho, Gaadi and Bikedekho. Tata Motors, which owns international automobile brands Jaguar and Land Rover brands, along with manufacturing their line of cars, trucks and SUVs. This investment was again talked and debated as industry watchers are trying to understand Ratan Tata’s objectives and plans regarding these investments. And now, his investment in mobile commerce leader Paytm has again created ripples across the eco system. Without doubt, the mentorship and guidance which Ratan Tata brings to the table is certainly invaluable for any startup. "Paytm Becomes Ratan Tata's 5th Ecommerce Investment", 5 out of 5 based on 1 ratings.